433 Jan DOYLE: THE ADVENTURE OF THE RETIRED COLOURMAN (Frank Wiles). 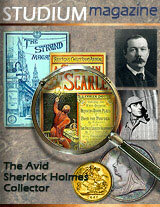 Sherlock Holmes portrait on cover. 435 Mar DOYLE: A SHERLOCK HOLMES COMPETITION: MR. SHERLOCK HOLMES TO HIS READERS* (illustrations from early Sherlock Holmes stories). Issues 435, 438. (DOYLE). A NEW SHERLOCK HOLMES STORY. * Announcement of "The Adventure of Shoscombe Old Place". 436 Apr DOYLE: THE ADVENTURE OF SHOSCOMBE OLD PLACE (Frank Wiles). Cover inset. 438 June DOYLE: THE SHERLOCK HOLMES PRIZE COMPETITION RESULT: HOW I MADE MY LIST. * Issues 435, 438. WODEHOUSE, P.G. : THE BISHOP'S MOVE (Charles Crombie) illustration. VACHELL, H.A. : MY DOUBLE (Stanley Lloyd). Cover. 442 Oct DOYLE: THE MARACOT DEEP: THE LOST WORLD UNDER THE SEA: I (T.H. Peddie). Cover illustration. Issues 442-446. 443 Nov DOYLE. THE MARACOT DEEP: II (T.H. Peddie). Issues 442-446. 444 Dec DOYLE: THE MARACOT DEEP: III (Tom Peddie). Issues 442-446. 445 Jan DOYLE: THE MARACOT DEEP: IV (Tom Peddie). Issues 442-446. 446 Feb DOYLE: THE MARACOT DEEP: V (Tom Peddie). Issues 442-446. SAPPER: THE FEMALE OF THE SPECIES: I (J. Dewar Mills). Issues 447-452. 447 Mar SAPPER: ALL ABOUT BULLDOG DRUMMOND* (drawing, photograph, cover illustration. 448 Apr DOYLE: WHEN THE WORLD SCREAMED: I (F.E. Hiley). Issues 448-449. SAPPER: THE FEMALE OF THE SPECIES: II (J. Dewar Mills). Issues 447-452. 449 May DOYLE: WHEN THE WORLD SCREAMED: II (F.E. Hiley). Issues 448-449. DOYLE and others: BLOOD SPORTS - SHOULD THEY BE ABOLISHED? SAPPER: THE FEMALE OF THE SPECIES: III (J. Dewar Mills). Issues 447-452. SAPPER: THE FEMALE OF THE SPECIES: IV (J. Dewar Mills). Issues 447-452. SAPPER: THE FEMALE OF THE SPECIES: V (J. Dewar Mills). Issues 447-452. 457 Jan DOYLE: THE DISINTEGRATION MACHINE (F.E. Hiley). Cover illustration. MALLOCH, G. R.: TRIAL BY ORDEAL (Leo Bates). Cover illustration. 468 Dec CAN YOU SOLVE THE BROOKMAN'S MYSTERY? A puzzle story in photographs, with solution. ROBINSON, W. Heath: IT IS ALL IN THE WIND. A full-colour drawing. SAPPER: THE DEATH SCRATCH: I (J. Dewar Mills). Issues 468-474. SAPPER: THE DEATH SCRATCH: II (J. Dewar Mills). Issues 468-474. SAPPER: THE DEATH SCRATCH: III (J. Dewar Mills). Issues 468-474. WALLACE: III. THE INHERITOR (Graham Simmons). Cover illustration. SAPPER: THE DEATH SCRATCH: IV (J. Dewar Mills). Issues 468-474. SAPPER: THE DEATH SCRATCH: V (J. Dewar Mills). Issues 468-474. WALLACE: V. THE BURGLAR ALARM (Graham Simmons). Cover illustration. 473 May SAPPER: THE DEATH SCRATCH: VI (J. Dewar Mills). Issues 468-474. SAPPER: THE DEATH SCRATCH: VII (J. Dewar Mills). Issues 468-474. 477 Sept (DOYLE). THE PASSING OF CONAN DOYLE. * By the Editor of "The Strand Magazine". DOYLE: A SCANDAL IN BOHEMIA (Sidney Paget). Reprinted from Issue 7. WODEHOUSE, P.G. : BIG MONEY (Charles Crombie). Issues 478-484. WODEHOUSE: BIG MONEY (Charles Crombie). Issues 478-484. WODEHOUSE: BIG MONEY (Charles Crombie). Issues 476-484. Reference: The Strand Magazine - 1891-1950: A Selective Checklist; J.F. Whitt; London, 1979.